Name of three places in Palestine. 1. A town, or place, memorable for the defeat of Gorgias by Judas Maccabeus (I Macc. iii. 40), situated in southern Judea, 22 miles, or 176 stadia, from Jerusalem. Its inhabitants were sold as slaves by Cassius (Josephus, "Ant." xiv. 11, § 2; "B. J." i. 11, § 2); but, through the exertions of Hyrcanus, they were freed by Marcus Antonius ("Ant." xiv. 12, § 2). Afterward Emmaus became a Jewish toparchy, the general of which was John the Essene ("B. J." ii. 20, § 4). Burned (c. 4 C.E.) by the Roman general Varus, it was rebuilt about 220 by Julius Africanus, receiving the name of "Nicopolis." It is known at present as "Amwas," south-southeast from Lydda Emmaus is frequently mentioned in the Talmud and Midrash. The spelling varies— , , and . It is stated (Eccl. R. vii. 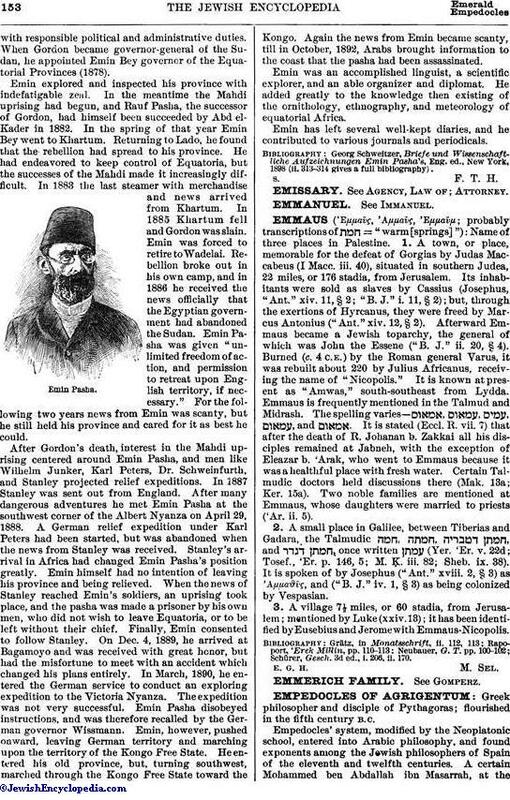 7) that after the death of R. Johanan b. Zakkai all his disciples remained at Jabneh, with the exception of Eleazar b. 'Arak, who went to Emmaus because it was a healthful place with fresh water. Certain Talmudic doctors held discussions there (Mak. 13a; Ker. 15a). Two noble families are mentioned at Emmaus, whose daughters were married to priests ('Ar. ii. 5). 2. A small place in Galilee, between Tiberias and Gadara, the Talmudic , and , once written (Yer. 'Er. v. 22d; Tosef., 'Er. p. 146, 5; M. Ḳ. iii. 82; Sheb. ix. 38). It is spoken of by Josephus ("Ant." xviii. 2, § 3) as Αμμαϑῦς, and ("B. J." iv. 1, § 3) as being colonized by Vespasian. 3. A village 7½ miles, or 60 stadia, from Jerusalem; mentioned by Luke (xxiv. 13); it has been identified by Eusebius and Jerome with Emmaus-Nicopolis. Schürer, Gesch. 3d ed., i. 206, ii. 170.